1) A Jew in an Arab country had no rights. I learned to drive a car in Mexico at the age of 27, in Mexico. I once took my mother, Shella Samra z"l, in my car down a street in Polanco, when a policeman stopped us, asked for my papers and told me that I had passed a red traffic light (which was not true). He started a discussion like many of those we have all had with representatives of order. Suddenly, my mom leaned out and said to the police: "Sir, please forgive my daughter, she is very distracted, please forgive her". "Mom!" I was outraged, "why do you ask the officer for forgiveness? You know I did not pass the traffic light. " Putting aside my protest, she continued praying: "Please, officer," give us your hand, "my daughter is very absent-minded." At that moment, I understood that, despite having a Mexican passport, my mother suffered from old complexes that made it difficult for her to feel like a complete Mexican citizen; since, by force of habit and having grown up in an Arab country, she knew that a Jew does not claim his rights, but asks for favors, an attitude inherited from a whole life in the shadow of discrimination and fear of authority. 2) A Jew was not worthy of nationality. When the State of Israel was born, my father's family had to escape from Syria to Lebanon through the border between both countries. And they chose Lebanon for a simple reason: they were stateless. Syria did not consider that its Jews, although born in Syrian territory, deserved to have passports or documents of Syrian nationality. Lebanon also did not want to give nationality to the Syrian Jews. So the nationality we just had was ... the Iranian, but granted by the Shah's Iran. And how did the Jews of Syria and Lebanon get Iranian nationality? There are two versions. One of them explains that the precious passport was exchanged for a school that the Jews sponsored in Iran. The other was told to me by Mr. Maurice Helwani, a Lebanese Jew, who, by chance, had been a banking partner of the man who became Foreign Minister of Iran. It happened that both men had procreated only daughters. Noting the sensitivity of the situation of stateless Lebanese Jews in Lebanon, Maurice Helwani moved to Iran. He went to see his friend and said: "We both have only daughters. In the Jewish tradition, as in the Muslim one, there is no one who prays for us after the deceased (in Judaism, only males can say Kaddish). Let us do a good deed by which we can be remembered; grant Iranian passports to Jews from Syria and, after 120 years, many will pray for our souls. " 3) To be an Arab Jew was to secretly profess the love of Israel, and it is this secret love that produced the most fanatical Zionists on the planet. In 1948, Lebanon was one of the first countries to declare war on the newborn State of Israel. There, the Jews of Lebanon were considered a sort of captive fifth column, subject to the wishes and whims of the authorities. 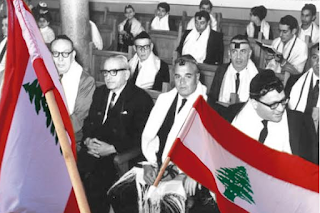 In spite of that, I would like to say that Lebanon often looked the other way when the Jewish Community of Lebanon served as a stopover for Syrian Jews escaping to Israel. The "Club" of the Jewish community, a recreation area for young people, served as a refuge for these Jewish boys who risked their lives to flee from Syria. Many times we brought them oranges and toothbrushes, and they disappeared the next day. For security, the slogan of our community was to affirm the following: we were Jews by religion, but not Zionists. Furthermore, we were Jews who completely disapproved of the State of Israel. Therefore, no kippot or necklaces with stars of David in the street, no Israeli flag in sight; Lying if we were asked our religion, saying we were Christians. After the Six Day War, my father risked his life to bring my mother an exceptional gift: the disc of Yerushalayim Shel Zahav ("Jerusalem of gold"), wrapped in her underwear. I remember the whole family sitting around the turntable, after having carefully closed doors and windows, to listen to the victory songs of our spiritual homeland, so close and so distant at the same time; while, in the streets, demonstrations approached dangerously close to the Jewish neighborhood, to the shout of Falastin Bladna or Lyahud klabna ("Palestine is our land and the Jews our dogs"). In the civil war, my mother destroyed the record, for fear they would find him in our house and accuse us of being Israeli spies. 4) Being an Arab Jew was to make your own textbooks. And here I would like to pay homage to the Alliance Israelite Universelle school and to the teachers who risked their lives so that we would not lose our Jewish identity and learn such a good Hebrew that, upon our arrival in Israel, no one believed that we were not native speakers. Among them: my mother Shella Cohen of Samra and Moré Moshe Kamhine, z"l.
My mother educated tens of generations, teaching Hebrew in preschool wholeheartedly. She always liked to sing and did it with her children, teaching them Judaism with joy. Since the school did not have educational toys, my mom bought them with her own money. I carried out the teaching of my grandfather: 'always carry with you two loaves, one for you and another because someone could be hungry'. She shared her breakfast with the children in the class and did not want to leave the school until its final closing in 1975, during the civil war. El Moré Moshe Kamhine, who died in Mexico, was a Mason and a great Zionist. In Lebanon there were no textbooks for the teaching of Hebrew, but that did not stop him: he crossed the border with Israel and returned with a copy for each level; Next, we young people made our own books with the help of"stencils", a kind of photocopying process. I can assure you that, after the hard work of copying and stapling the volumes, these were the most cared for books in the world. He taught us the traditions and customs of the Jewish people, organized celebrations of the festivities and their extraordinary "Oneg Shabat" each week. His wife Frida sewed costumes and costumes. Later we learned that he had hidden weapons for the defense of the community, and that he had made an alliance with the Falangists, the Christian militia of Lebanon, which defended the entry of the Jewish neighborhood when the anti-Israel riots got too close. We also learned that the Lebanese authorities forced him to teach Hebrew to the high command of the Lebanese army, but this also benefited him: on the day of graduation, Kamhine took a picture with the class in its entirety, a picture that, with everything and names of the officers, ended up in the hands of Israeli intelligence. When, in the middle of the civil war, a Jew was killed by a sniper at the gates of the Temple, Mr. Agami, in charge of the synagogue, wanted to give him a dignified burial. He asked a Muslim friend to help him transport the deceased. Suddenly, the same sniper hit the Muslim with another accurate bullet. Relatives of the new victim lamented: a Muslim killed because of a Jew! A Jew! It was like saying: because of a fly! Even Kafka himself would not have said it better.